River Oaks OB/GYN stands ready to assist you in any way we can. No doubt you have great expectations … and a lot of questions. Whether this is your first pregnancy or your third, River Oaks OB/GYN stands ready to assist you in any way we can. The information shared below is here to help you during your pregnancy, in the weeks and months to come in anticipation of a happy and safe birth experience. To schedule an appointment, call our office during regular office hours at (574) 522-5562 or (574) 295-8805. During your pregnancy, there are certain things you should do. Take your prenatal vitamins every day. If you have any common discomforts or illnesses during this pregnancy, please contact us for a list of medicines that are safe for you to take. Keep all of your prenatal visits. If you are unable to come to a scheduled appointment – PLEASE CALL TO RESCHEDULE! Register (by 28 weeks of your pregnancy) and attend childbirth classes at Elkhart General Hospital. If you want to option of using epidural anesthesia or want to know more about it, register and attend the Epidural Class at Elkhart General Hospital (before 36 weeks of your pregnancy). You may also ask to view an epidural video at our office. The Special Beginnings Unit of Elkhart General Hospital is excited about your pregnancy. For those of you having your first baby, childbirth classes can be an important part of your preparation for this event. By becoming familiar with the labor and delivery process, and with the Special Beginnings Unit, you can learn what can be done to make this an easier process by learning both medical and non-medical ways to keep you more comfortable during labor. Elkhart General realizes how valuable your time is and so they offer a weekend childbirth class for those of you with busy or unusual work schedules. If you are not having your first baby but want to brush up on the process of giving birth, there are also classes on childbirth for you. If you have not delivered a baby at Elkhart General, you may find a tour with an opportunity to ask some questions may be what you need. Whatever your needs are, Elkhart General is here to serve you. Please call by your 5th to 6th month of pregnancy for classes. To sign up for prenatal classes or make an appointment for a tour, call the Nursing Office at (574) 523-3297. 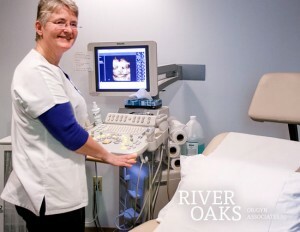 You can call the River Oaks OB/GYN office during regular office hours at (574) 522-5562 or (574) 295-8805. If you have an emergency after hours, call our answering service at (574) 295-8805. When labor contractions become regular, start timing them. During the evening or night, if you note 12 labor contractions in 2 hours, each lasting 30 seconds or if water breaks, go directly to Elkhart General Hospital through Admitting at the “Main Entrance”. After 8 p.m., go through the Emergency Department (without calling the doctor for approval). You do not need to call if you think you have passed your mucus plug. However, if you are in question about what you should do, please call our office at (574) 295-8805. In the evening and at night, the answering service will contact the physician. Please note: If there is a delay in the doctor returning your call, it may be due to him/her being in delivery or surgery. If you can not wait – you certainly may proceed to the hospital. To schedule an appointment, please call us during regular office hours at (574) 522-5562 or (574) 295-8805.